On April 13th 1919 protesters had gathered in the Jallianwala Bagh in Amritsar, India. Several thousand people in all packed the public gardens. The British Army officer in charge of the city, Colonel Reginald Dyer, assembled a unit of 90 Gurka soldiers under British command and proceeded to the gardens. He ensured that the exits were blocked and ordered his troops, armed with Lee-Enfield rifles, to open fire. They continued to fire for ten minutes until their ammunition was expended. The official death toll, according to the British, was 379 dead and over a thousand wounded. The report issued by the Indian National Congress claimed that more than a thousand had been killed. The alleyways leading to the garden were too narrow for Dyer’s armoured cars and so he had to leave them behind. At the inquiry he testified that he would have used them, and their machine guns, if he had been able to. I visited Amritsar on my way from India to Pakistan in 2009, ninety years after the atrocity. I vividly recall visiting the Jallianwala Bagh and walking around the memorial site which felt very much like sacred ground for the Indian independence movement. Bullet holes in the walls were still visible. The well, down which many people threw themselves to avoid the bullets, is still visible. 120 bodies were later removed from its depths. Yet the impression which is seared most powerfully onto my memory is the reception I received from Indians visiting the site. I wanted to hide away, to go incognito, to avoid being connected with the massacre. I am British, after all, and although even my grandparents were not born in 1919 I nevertheless feel a sense of regret and grief at what happened. While not personally responsible for it I am nevertheless connected, by dint of my passport if nothing else. I tried to avoid people, to avoid getting into conversations, and yet Indian people are so welcoming that this was impossible. “I’m so sorry for what happened here”. The students smiled. Oh please, do not worry. It was a long time ago. These things are in the past. You should not worry about it. You are welcome. You are most welcome. “You are most welcome in India”. We shook hands and departed, and as I walked back to my hotel in the searing May heat my footsteps were oddly light. 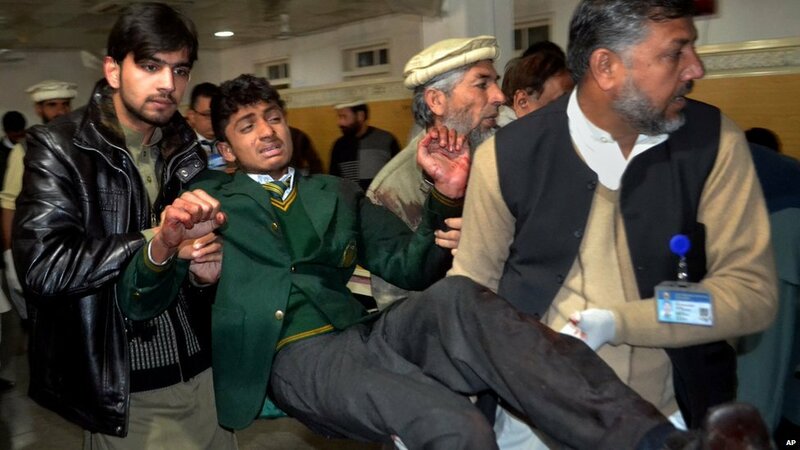 Yesterday one hundred and thirty-two schoolchildren were murdered by terrorists at their school in Peshawar. The funerals are already taking place, as is normal in Islamic countries. One hundred and thirty-two coffins, heartbreakingly small; one hundred and thirty-two sets of grieving parents; one hundred and thirty-two families whose future has been snatched away in a heartbeat. It is too much to bear. Jesus, whom Christians like me believe to be the son of God, had much to say about suffering. On numerous occasions he predicted that suffering would come, that his followers would be handed over to the authorities, that they would be killed. In the Gospel of Matthew he stated that he was sending his followers out “like sheep among wolves”. Yet he also instructed us how to respond to suffering. We should not retaliate, but instead should “turn the other cheek”, we should “bless those who persecute us”. Paul, a leader of the early church, agreed: “Bless those who persecute you; bless and do not curse”. But this rage will not help. Fighting violence with more violence will only beget yet further violence. This attack was carried out in response to the army offensive against terrorists in Waziristan, an offensive that was launched in response to terrorist attacks in Pakistan, which were carried out in response to a previous offensive against terrorists in the Swat Valley….and so the cycle goes, an eye for an eye, a bomb for a bomb, a massacre in return for a massacre. The same cycle spins in Israel and Palestine, and it spins in Syria and Iraq, and it spins wearily on its bloodslicked axis wherever men with cruel faces lift rifles to their shoulders or pull pins from grenades. Nothing will change, if we carry on like this. This is why Jesus said what he did. Because he knew that the only way out of this deepening torrent of murder and darkness was to choose a different course of action, a decision so illogical, so difficult, that it makes us want to laugh. To forgive. To refuse to bear a grudge. To offer love in the place of anger. This is why he chose to give his life in our place, uttering the words “Father, forgive them” even as men committed barbarities against him. Because this offers us a way out. I can’t do it. But I know that I have to do it. The words of forgiveness stick in my throat, as if even my larynx cannot bring itself to utter something so contrary to human nature. It is a choice between darkness and light, and yet darkness is so much easier. It is still too raw. I was driving through Islamabad recently when a traffic policeman pulled me over. As a moderately conscientious motorist who has never received a ticket or fine nor been in any kind of significant accident my brushes with traffic policemen are infrequent. In fact in Pakistan the only reason I ever have to speak with one is either because they are bored and want someone to chat to, or, as happened to me recently, they want to borrow a pencil. I didn’t have one. He seemed confused. “If you don’t have a pencil, how do you write?” he asked. I attempted to respond that although I liked writing I tended to do so with a computer, and, either way, that I tended not to do any kind of writing while driving, but he laughed and waved me on. Anyway, on this particular day the policeman seemed moderately irate. This is odd, because in my experience Pakistani traffic policemen are courtesy itself. I greeted him and asked him what the matter was. “You were talking on your phone” he said. This was undeniable. A friend had called about a meeting later in the day and I had answered. Though illegal in the West I had no idea that such a thing was also illegal in Pakistan. I told him that I was terribly sorry and that I had no idea such a law existed. He flipped to the appropriate page in his book of fines and showed me the small print. There it was – “talking on mobile, 300 rupee fine”. Bang to rights. Caught red handed. Busted. “I’m so sorry, sir” I replied. “You’re quite right. I ask for your forgiveness”. He seemed dumbstruck. He scratched his head in confusion. “You know I have to give you a ticket, right?” he said. “Of course, you are quite right. It is your job. I am sorry to have caused you such bother”. He didn’t know what to do. People in Pakistan generally argue in this kind of situation. Minor infractions lead to major disagreements, with lots of gesticulating, shouting, and usually bystanders getting involved for no apparent reason other than their love of a good show. Nobody ever apologises, and certainly nobody ever asks for forgiveness. “Ok, next time” he said, with a confused face and perhaps the hint of a smile. “Don’t do it again”.